An easy cheesy biscuit recipe from scratch! Makes moist, cheesy, tall biscuits. When it comes to biscuits I am a huge fan! I have to admit though I have had many failed attempts at making biscuits. Sooo many of my batches in the past have turned out hard, dry, flat, & not tasty. 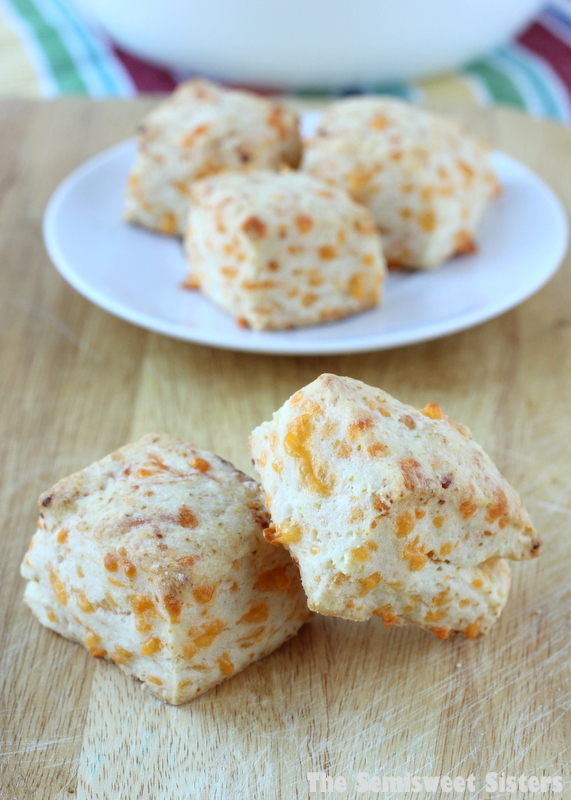 I’m happy to say that I have two go to biscuits recipes now though & this Easy Cheddar Cheese Biscuit Recipe really is easy & one of my favorites! So if your like me & have had no luck in the past with biscuit recipes don’t give up! I urge you to give this one a try. It really is possible to make moist fluffy tall biscuits! 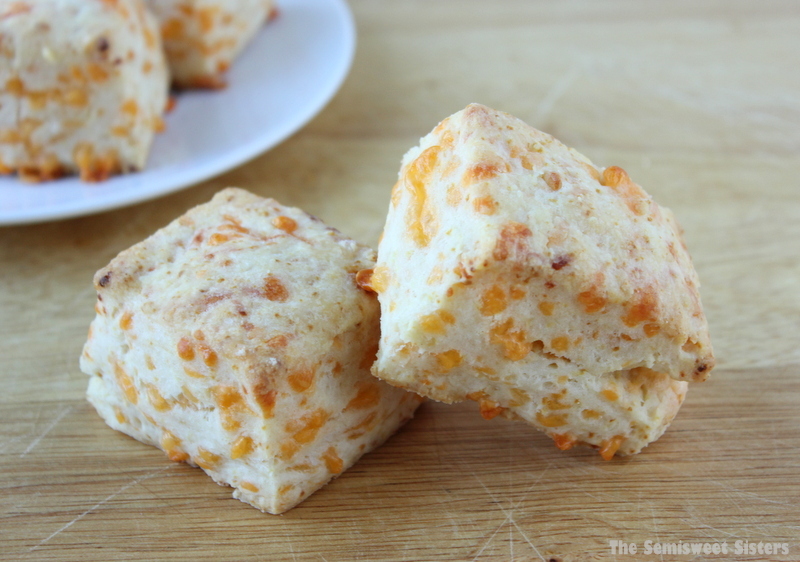 These cheddar biscuits make for a tasty appetizer & go great with soup & salads! I ate 3 warm biscuits practically straight out of the oven. Then later in the day I ate one when it was cold & it was still just as good. These biscuits grew nice a tall in the oven. They turned out soft, moist, & cheesy (my idea of the perfect cheese biscuit). You can make half a recipe if you don’t want to make a large batch. Also if your not a big fan of salt you might want to cut back on the salt a little with this recipe because the cheese gives these a salty flavor (but I like salt so I’m not complaining). Preheated oven to 400 degrees. Line a cookie sheet with parchment paper or nonstick baking mat. In a large mixing bowl whisk together flour, baking powder, & sugar. Add salt, 1¾ cups heavy cream, & the cheeses & stir to combine. Then use your hands to finish incorporating the ingredients. If it's too dry add the remaining ¼ cup of cream. (It may seem a little dry but if all the flour is mixed in it should be good, you may have some crumbs left in the bottom of the bowl, that's ok). Place the dough a lightly floured surface & gently pan down the dough making a 8x8" square that is 1" thick. You can pat in the edges to make them a little straighter if you want. Using a floured knife cut the dough into 1½" squares. Place on cookie sheet about 1-2" apart. (You don't want them to be too close together). Bake 15-20 minutes or until the edges are starting to turned golden brown. (If your using more than one cookie sheet, place the 2nd in the frig while the first batch bakes). Biscuits will continue to cook for a few minutes once they are removed from oven. Let cool for 5-10 minutes then enjoy! Adapted slightly from Old-School Comfort Food by Alex Guarnaschelli.